I have to give it up to Lenovo: they are creating some great, pro-Chromebook content in support of their latest, greatest Chromebook – The Thinkpad 13. If you recall, we talked about their first ad in this series about a month ago and were pretty impressed with what they put together. The most interesting thing at the time was the fact that Lenovo was touting Android Apps before Android Apps were a thing on the Thinkpad 13. Fast-forward a month and not only do we have an available touchscreen model available, we also have great hope that the Thinkpad 13 will be getting Android apps very, very soon. Of the three Chromebooks left off the v54 update, we’ve seen evidence of Android Apps on the Dev Channel for the HP 13 G1 and fully expect the same treatment for the Acer 14 for work and Lenovo’s latest. Today we came across some additional video ads by Lenovo and wanted to share them. Not only do they provide some great info on how great Chromebooks can be for consumers and enterprise alike, one in particular takes aim at some of the worst myths that surround Chromebook use. Let’s be clear: Chromebooks are still in the process of breaking into the realm of consumer mind-share. People are beginning to recognize the name, but still have no real idea what Chromebooks are capable of. Regardless of a single, witty encounter, the truth remains: people still don’t really know what to make of Chromebooks and there is a ton of false info out there about them. While Lenovo isn’t exactly here to set the record straight, in their effort to sell their latest Chromebook, they are providing some really great Chromebook evangelism in the process. I want to share these videos not just because they are great, but also because there are many of you who are new to the Chromebook community or have some people around you that you think would benefit from a Chromebook. These videos should help on all fronts. 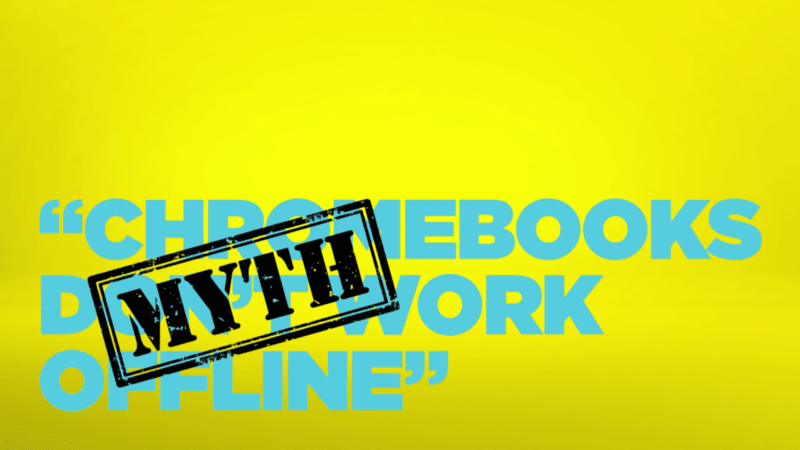 Here’s the myth-busting video, followed by a link to Lenovo’s Chromebook-centered YouTube Channel. Enjoy.